Premium Login – Authentication System Created by EdcoreWeb. 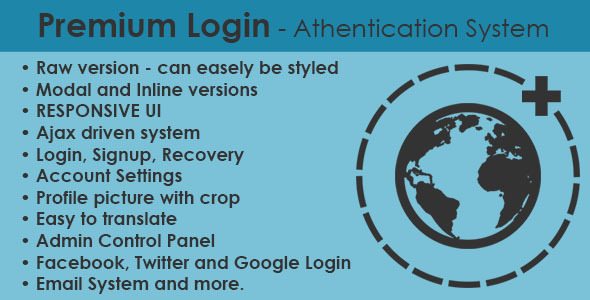 This templates have specific characteristics, namely: Premium Login is an authentication/user membership system with lots of features.Integrate this awsome script in your website within minutes or use its raw version to create your own . You can use this Premium Login – Authentication System on Php scripts category for Account System, accounts, admin, ajax login, Login/Sign up, PHP Account, premium login, user management, User Membership System, User profiles, users and another uses. AJAX Driven System – All of the form are submitted with AJAX to minimize page refreshes and for a better user experience. Modal System – All actions are made via dialog prompts so you don’t have to redirect users to a specific page to login/sign up or change any settings of their accounts. Inline System – If you don`t want to use the modal version you can always use the good old inline version. Login & Sign up – Login or create a new account. Facebook & Twitter & Google+ OAuth – Use your Facebook, Twitter or Google+ account to login/sign up without completing any form. Email activation – Users have to activate their accounts via a email activation link. Password recover – Request a email recover link to reset your password. Account Settings – Change your account information or other settings. Profile Pictures – Upload a image from your computer for your profile avatar. If you have logged with your Facebook, Twitter or Google+ account you can use the profile picture from those. User roles – Users can have the role of a simple user or an admin. Admin Control Panel – View, edit, delete users via a simple admin interface. Email System – Send emails to users in no time via the Admin Control Panel. PHPMailer – with your server email or even with your Gmail account. Easy to translate – Change all of the script translations in few minutes by modifying the config/lang.php file. Want something that’s not here ? Leave a comment or send me a message !